Dr Susan Graham is working on a drone system that can scan for ideal places to grow trees before firing germinated seeds into the soil. Drones are fast, fully-programmable, and can reach areas impossible to reach by other means. “Although we plant about 9 billion trees every year, that leaves a net loss of 6 billion trees,” Dr Graham told reporters. Working from Oxford University in the UK, Dr Graham has collaborated with an international team including an ex-NASA engineer. They have formed a company, BioCarbon Engineering, and even gained backing from one of the world's largest producers of drones. 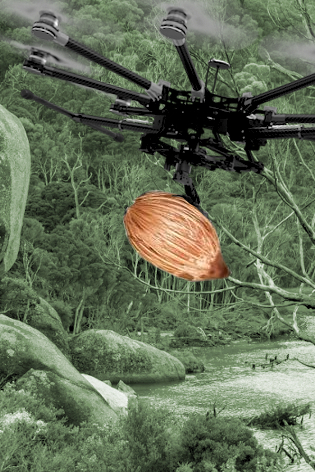 BioCarbon Engineering CEO Lauren Fletcher says the drones can carry about 150 seed pods at a time. “We're firing at one a second, which means a pair of operators will be able to plant nearly 100,000 trees per day — 60 teams like this will get us to a billion trees a year,” he said. The system sends out a scanning drone first to map and plan a planting pattern to be followed by seed-firing drone. The scanning drone can create a 3D model of the land, and then an algorithm is applied to plot the most effective was of covering it. The team run tests in the New South Wales Hunter region, where their seed-spreading drone has helped rehabilitate land once used by coal mines. “Coal mines have an enormous amount of land that they need to restore, both on the active mine site, once they've recreated a land form, as well as their offset areas ... around the mines,” Dr Graham said.